Please join our team on 5-6 May 2019 and make this prestigious running event a massive success for Milton Keynes! We need your help! Without your support and effort, the MK Marathon would not be possible. There are numerous opportunities to help ranging from helping to prepare before the event to setting up the course. On race-day, volunteers are needed to act as course marshals, to assist with the start and finish and to help with wrapping up festival activities. All volunteers receive an official volunteer t-shirt, packed lunch, commemorative badge and invitation to join us at Wetherspoons, Midsummer Boulevard in the evening of the event and the gratitude of thousands of participants! Sign up for your favorite MK Marathon volunteer position now! You will be contacted by our volunteer team closer to race day with final instructions. Thank you for your help and support! My favourite race that I volunteer to marshal at all year, it’s so well organised and a great atmosphere. I look forward to seeing all the returning runners and the new ones, especially if it’s your first marathon. This could be helping with registration, information, photography, baggage, marshaling, rewards, the start line or giving out medals at the finish. You can download the latest guide Event Crew Guide Here. Quality technical T-shirt for all volunteers. All Event Crew will receive a commemorative MK Marathon badge showing the year and number of the event. Each year you can proudly wear a lanyard displaying the pins from every MK Marathon you have volunteered at. 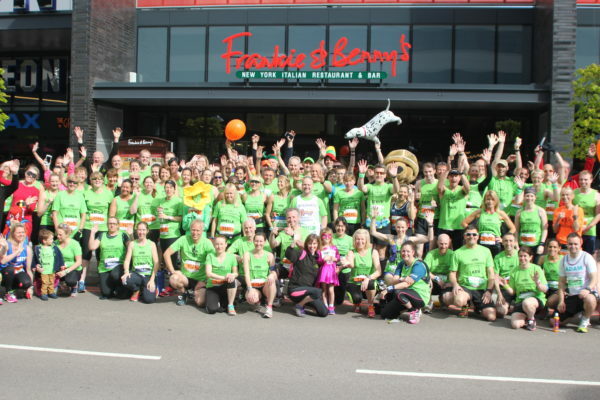 The Redway Runners, with over 1,200 members, are the biggest running club in Milton Keynes. Established in 2010, the club caters for every level of runner. Organised runs take place every day of the week. Redway Runners have been a major supporter of the MK Marathon from day one. Apart from the many runners that actually take part, great pride is felt by providing the MK Marathon team with hundreds of volunteers from among its members to make sure the day goes well. Thank you, Redway Runners! We are proud to have you as part of the MK Marathon family! 3. What if I cannot attend? 4. What if I cannot stay for the entire shift? 8. Do volunteers receive a discount on race entry fees? 9. What do I do if I do not receive my Race Crew confirmation e-mail or phone-call? 11. What if I’m unable to stand for long periods of time? You will receive a confirmation e-mail from the Event Crew Coordinator. Some further information exchange may be needed, to ensure that we understand your requirements fully. This is where providing your (mobile) phone number is important, as sometimes it’s easier to get finalise details by phone. Nearer to race day, you will get all the info about your tasks, joining instructions etc. Yes you can. There are many occasions when friends sign up together, and wish to work in the same area. Please encourage them to sign up. Please contact the Event Crew Coordinator as soon as possible by email. There are many reasons why volunteers find they cannot attend. The most important thing is to tell us as soon as possible, as we can then put contingencies in place. We always appreciate that you volunteered in the first place, even though circumstances may dictate otherwise. Once you sign up, we are counting on you to stay for the full shift. We count on each volunteer to stay until the end of the shift. However, we realise there could be an emergency, and if this occurs, we would appreciate if you contact your line manager by phone or text before leaving. All event crew will be provided with a baguette or roll and bottled water. However, bringing your own snack and drink is also highly recommended. The race is early May and the weather is usually warm and sunny, however there can also be rain! So you should bring layers and waterproofs if you are a course marshal. Please check the weather forecast beforehand and wear comfortable shoes. 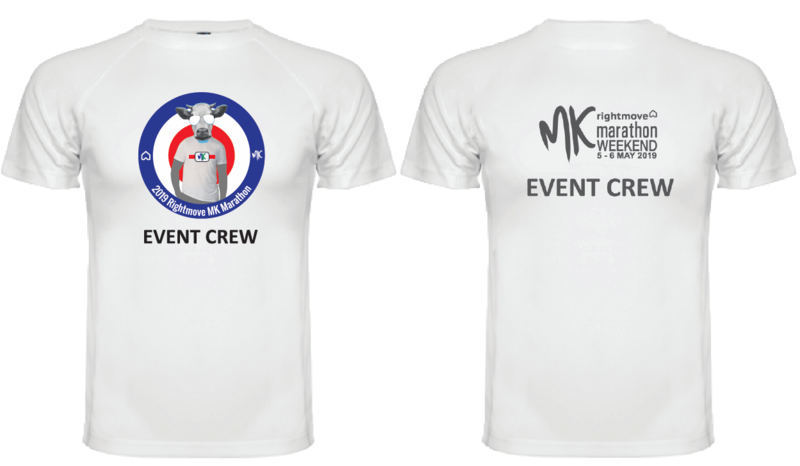 You will receive a Race Crew T-shirt that you should wear, that identifies you as a part of the official MK Marathon Event Crew. Yes, but there are restrictions. Normally, children will be part of an organised group, such as the Scouts, who will have their own supervision. The minimum age for someone to work on their own, or as a marshal on the race route, is 17 years. Final confirmation e-mails are sent 7-14 days prior to race day. If it is less than a week to the race, and you still don’t know all the information you need, please email the Event Crew Coordinator with your query. At the worst case, on race day, come to the volunteer check-in at the Stadium Arena – there will always be tasks to help with. When you volunteer please state any special requirements or disabilities on the sign up form. We will do our best to accommodate you.